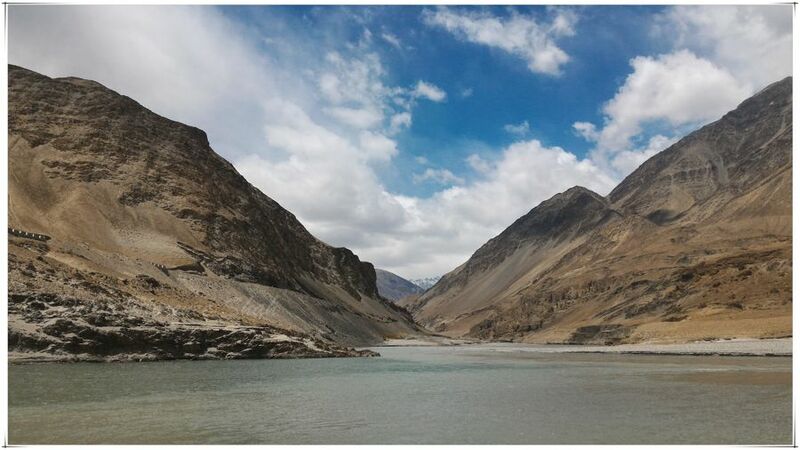 Whenever I saw images of Ladakh, they conjured up for me a land of stark mountain ranges, serene high-altitude lakes, and blue skies contrasting with cold desert landscapes. When I finally did my bucket list trip in May 2016, I found my imagination was not far from the truth. 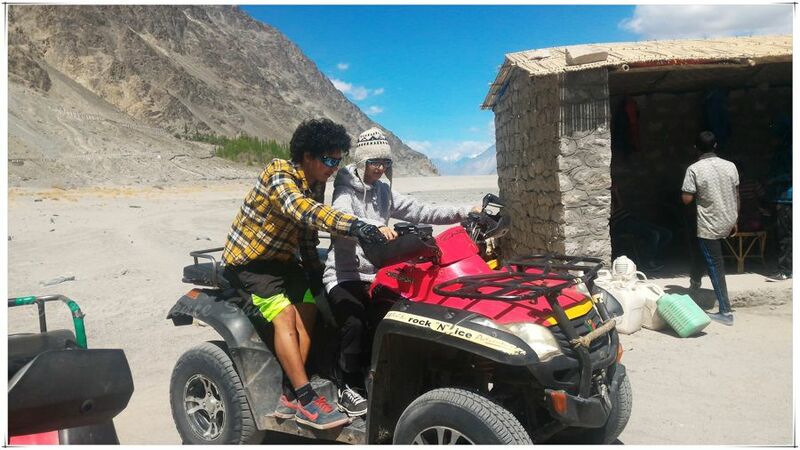 I had no desire to land up in Ladakh alone with my child, with no bookings and having to search out tour operators for excursions. Spontaneity and doing-it-yourself are not the right approaches for all vacations. When travelling with family, especially children, in such a remote place, I find it’s better to book a tour with a well-known operator. 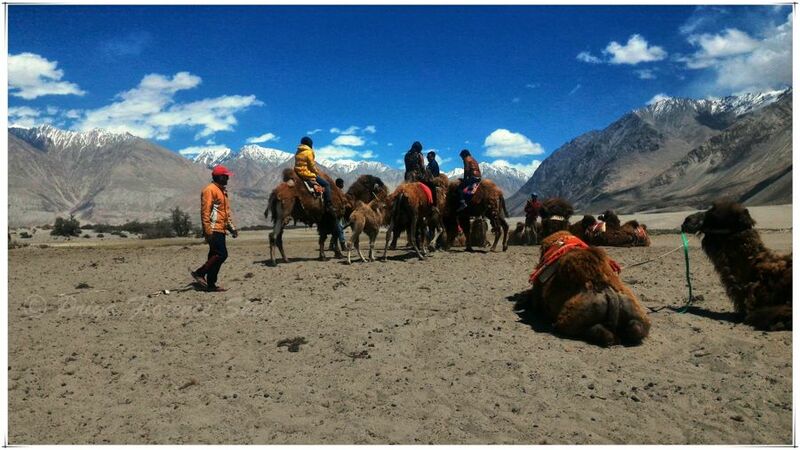 So I opted for the “Amazing Ladakh with 2 Nights in Nubra Valley” package from MakeMyTrip.com. The total cost of the package for both of us came to INR 43,521 (including taxes). This is how our trip went. 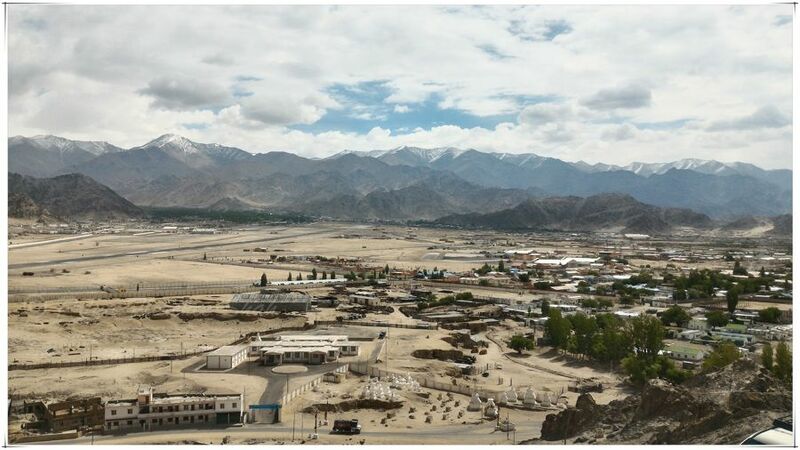 Leh, the capital of Ladakh is at an altitude of 3,524 meters (11,562 ft), so it’s important to acclimatize after coming into the city, before travelling further within Ladakh. The email from MakeMyTrip mentioned that it was best to spend a day to rest and get acclimatized to the place. They also recommend that those planning to have an anti-altitude pill before travel, such as Diamox, should consult an experienced doctor first. We boarded our flight from Pune to Delhi and flew on from there to the tiny Leh airport. 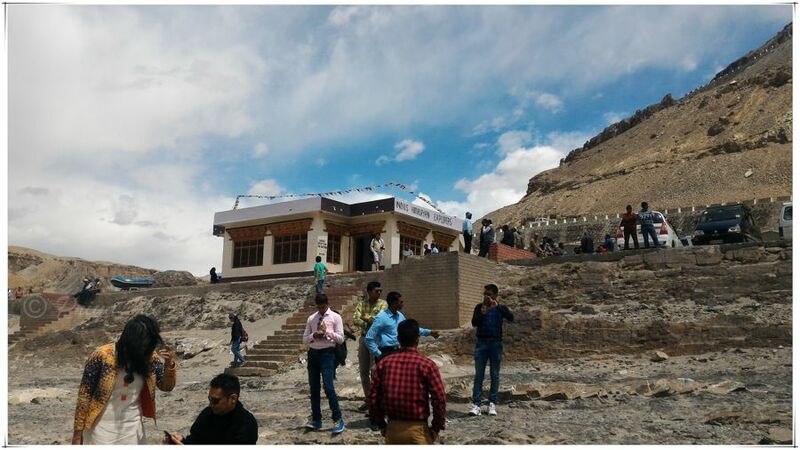 Upon arrival, a MakeMyTrip representative met us at the airport and transferred us by car to the 3-star Grand Willow hotel in Leh. After checking in at the hotel, we took their advice and rested for the day, having all our meals in the hotel dining room. The food was simple and not bad for a budget trip. I was worried about my child getting altitude sickness because of a history of asthma. Instead, I turned out to be the one who had trouble acclimatizing to the low oxygen levels, while my kid was absolutely fine. Luckily I had no debilitating symptoms, except for mild breathlessness when walking uphill on Leh’s undulating city roads. On the second day, we had our breakfast and went on a tour of some of the attractions near Leh. 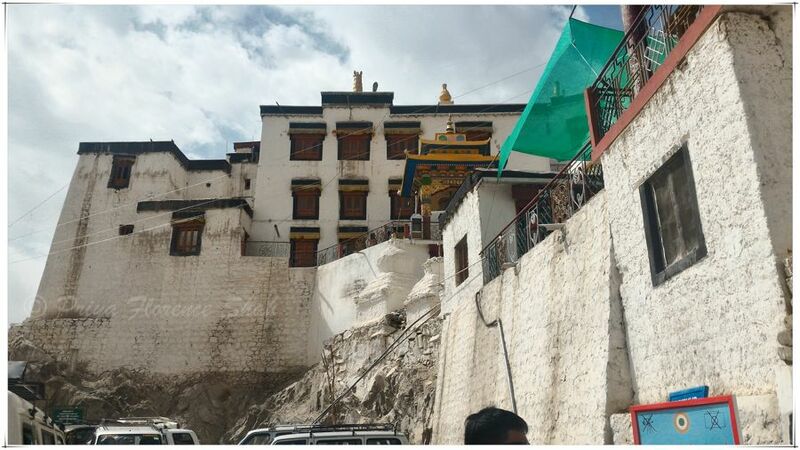 First, we went to the Spituk Gompa (monastery), just outside Leh. I got breathless climbing the monastery stairs, so I opted to stay lower, while my child climbed to the top of the monastery. But even from where I stood, the sight of the Leh valley below us was quite spectacular. 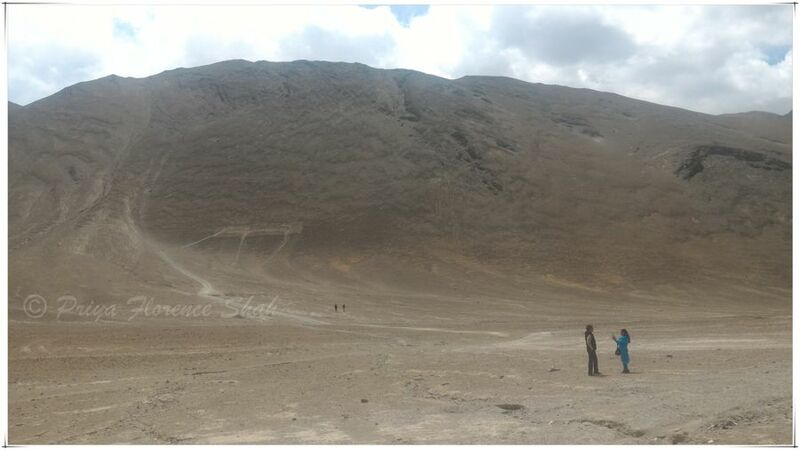 After our visit to the Gompa, we were taken to the Magnetic Hill outside Leh. Depending on whom you ask, the “gravity-defying phenomenon” that this spot is famous for has either to do with magnetism or an optical illusion. Unfortunately, on our visit there, I saw no sign of either phenomenon. So the Magnetic Hill turned out to be a bit of a dud. 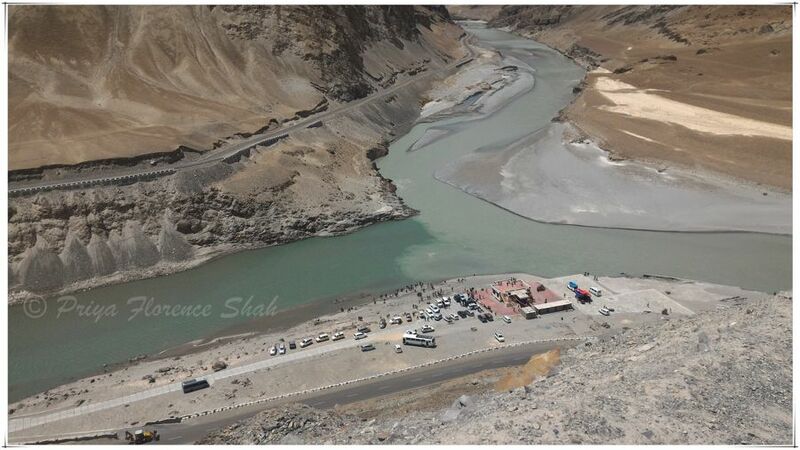 After that, we drove about 35 kilometres outside Leh city and 6 kilometres from Nimo village on the Kargil – Leh highway, to the Sangam or the Confluence of the Zanskar and Indus Rivers. The views at this point were quite breathtaking. Tall, sandy mountains almost devoid of vegetation, sloped down on either side of the river to meet at a Y-shaped curve called the confluence, where the two rivers meet. 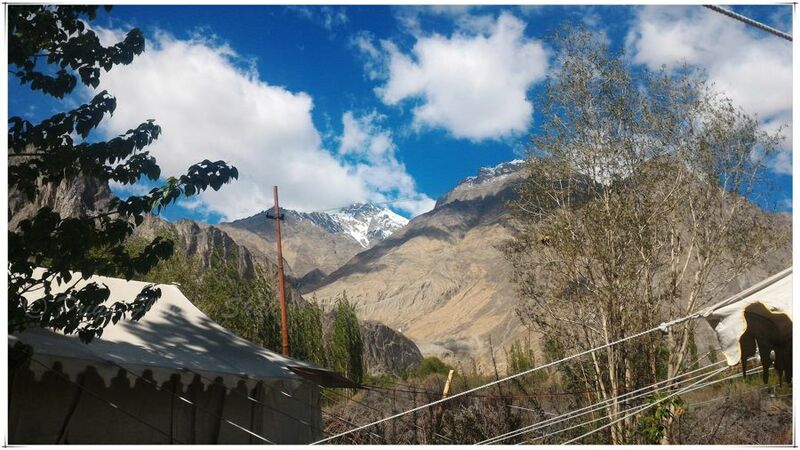 A little one-storey cabin near the road, belonging to Indus Himalayan Explorers, offers rafting and kayaking gear for the more adventurous traveller. This is a fantastic place to enjoy water sports, or just stand and skip pebbles over the waters. On our way back, we stopped to visit the Gurdwara Pathar Sahib, a Sikh temple managed by the Indian army, where we enjoyed the Langar – free food served to visitors at the community kitchen in gurudwaras. 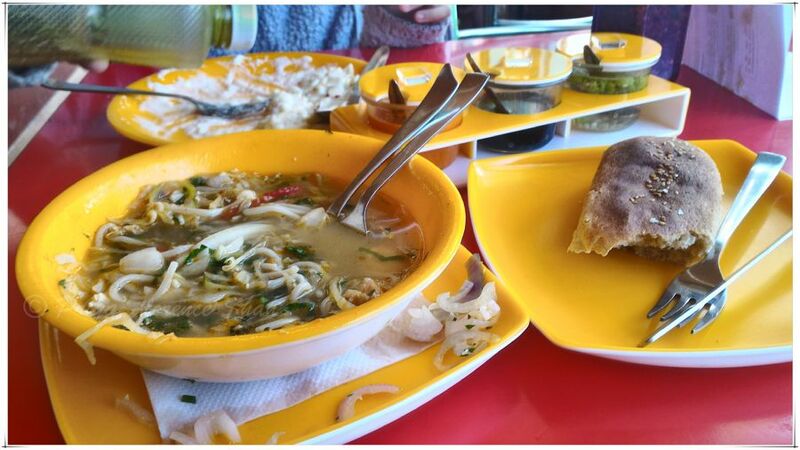 After returning to our hotel, I had a hankering for some authentic Ladakhi food. So, my child and I walked to a restaurant near our hotel, where I had the Tibetan Thukpa (noodle soup), which was quite delicious. The portions were a bit too large for me, though. The next morning, we woke up early and had a quick breakfast to begin our 140 km drive to Nubra Valley, about 5 to 6 hours away. On the way, we passed by the Khardung-la Pass – incorrectly cited as the highest vehicle-accessible pass in the world – at an altitude of 5,359 meters (17,582 ft) above sea level. 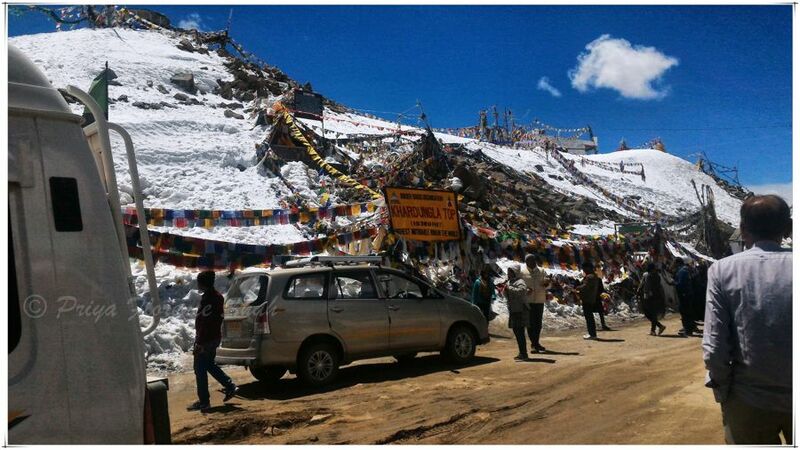 Maintained by the Border Roads Organisation, the pass is strategically important to India as it is used to carry supplies to the Siachen Glacier, the highest and coldest battlefield in the world, at an average altitude of 20,000 feet. 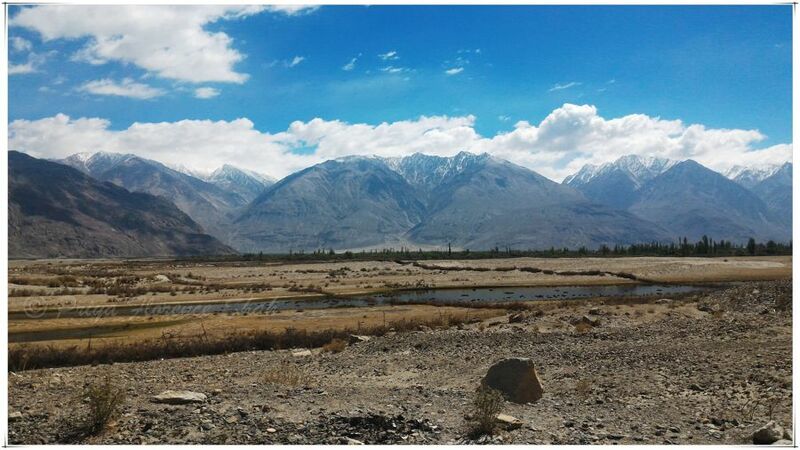 As we entered Nubra Valley, I was stunned at how much it reminded me of the description of the fictional Shangri-La from James Hilton’s novel, Lost Horizon. 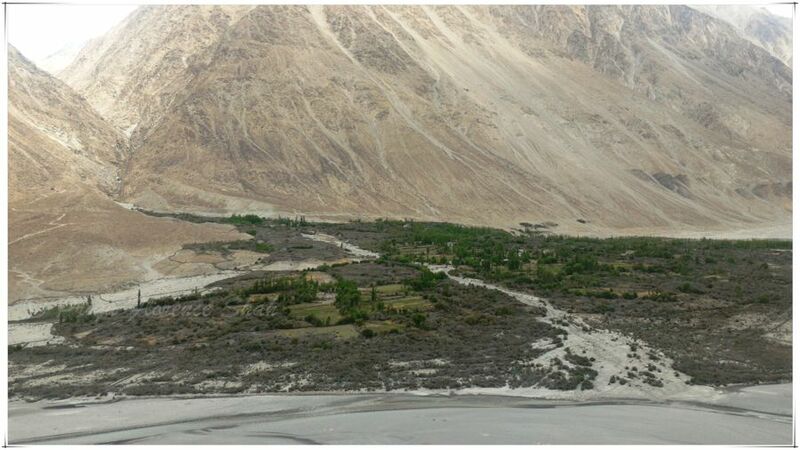 Rivers and rivulets run through the Nubra Valley carrying fertile alluvial soil, making the valley an oasis of green in the desert landscape of Ladakh. After our long drive, in the company of a Gujarati family of four, we checked into our tent camp in Hunder in the Nubra Valley. I took a nap till dinner, while my child had fun playing with the family that had accompanied us. 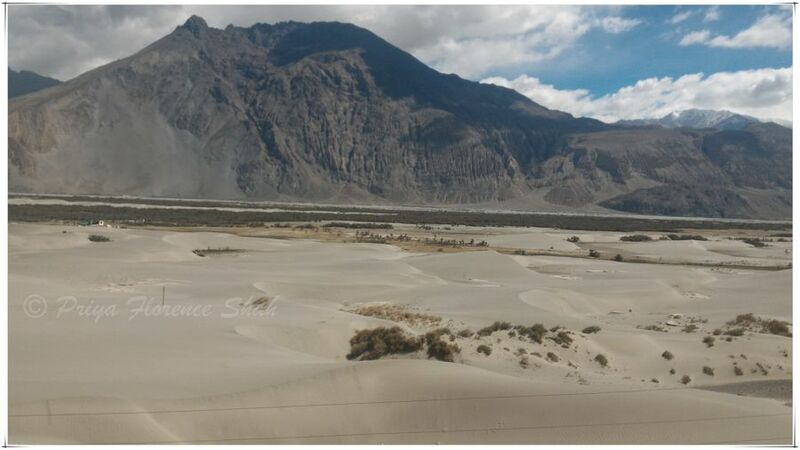 The next morning, we set out to do some sightseeing in Nubra Valley, starting with a visit to the White Sand Dunes at Hunder. My child enjoyed an ATV ride on the sand dunes, while I took photos and took in the scenery. 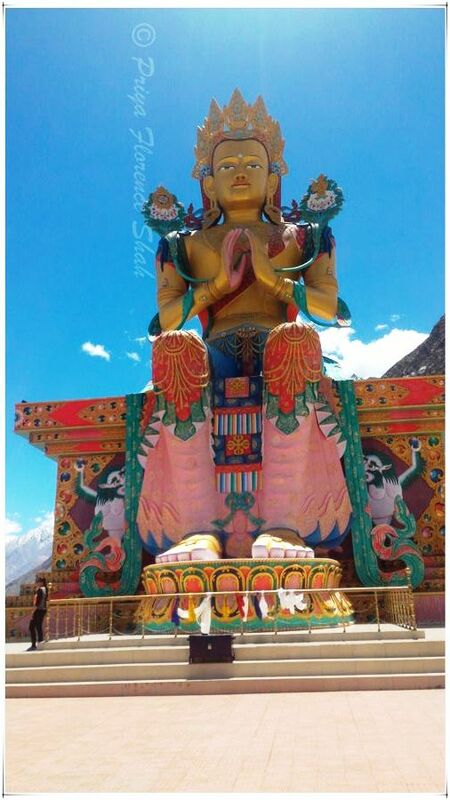 After that, we visited the Diskit Gompa, the oldest and largest Buddhist monastery in the Nubra Valley. It features a 32-meter statue of Maitreya Buddha. After our tour of the monastery, our guide took us across a small rivulet to see a herd of Bactrian camels. Since I do not believe in riding or any form of exploitation of animals, I sat out the camel ride with my child. Instead, I busied myself taking photos of these two-humped animals that have a tremendous tolerance for cold, drought, and high altitudes. 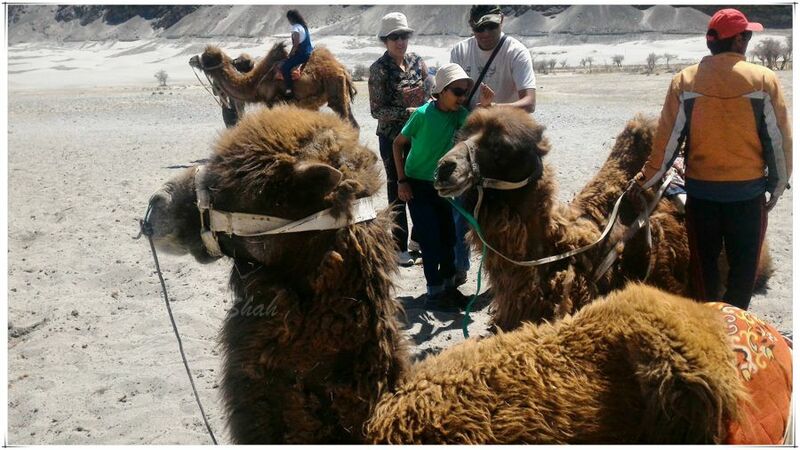 The domesticated Bactrian camel has enabled the travel of caravans on the Silk Road and been used to travel in inner Asia since ancient times. After our visit to the camel camp, we returned to our camp in Hunder for dinner and rested till the next morning until our journey back to the hotel in Leh. 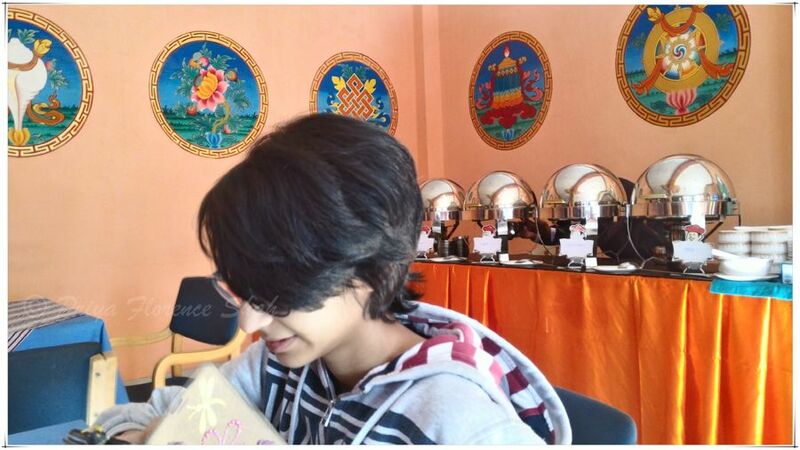 I skipped the shopping tour in Leh, although my child accompanied the Gujarati family on their excursion. I had purchased a jacket in a tiny market in Nubra Valley, but on reaching Leh, realised that the zipper was of poor quality, so I gave it to a mochi (cobbler) in the main square near our hotel for repairs. 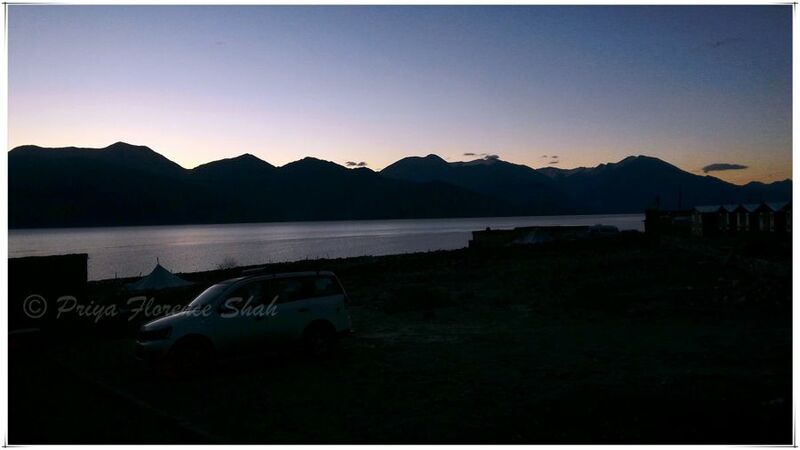 We were to go on a day excursion to the Pangong Tso (Lake) the next day. 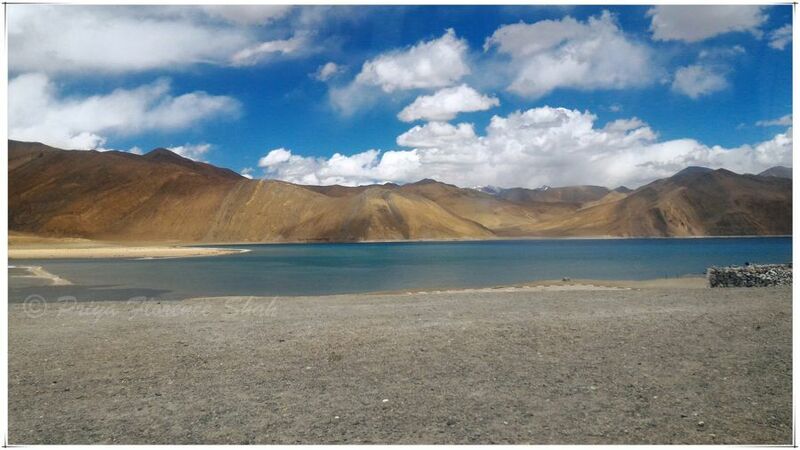 The distance from Pangong Lake to Leh is a round trip of 280 kilometres. 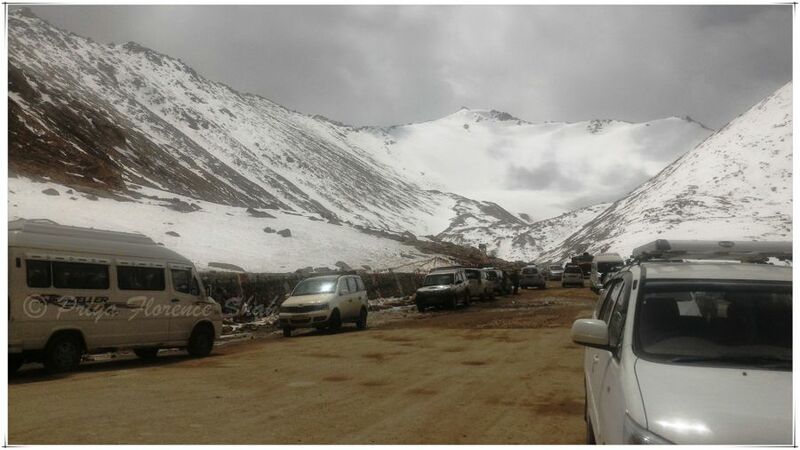 It’s a 5-hour drive from Leh, most of it on rough and winding mountain roads. It exhausted me just to think about it. Now, I love mountain lakes and Pangong Tso was very much a bucket list trip for me. So I asked our tour guide if my child and I could extend our stay at Pangong for a night and return the next day. In this, I found that MakeMyTrip did not disappoint. 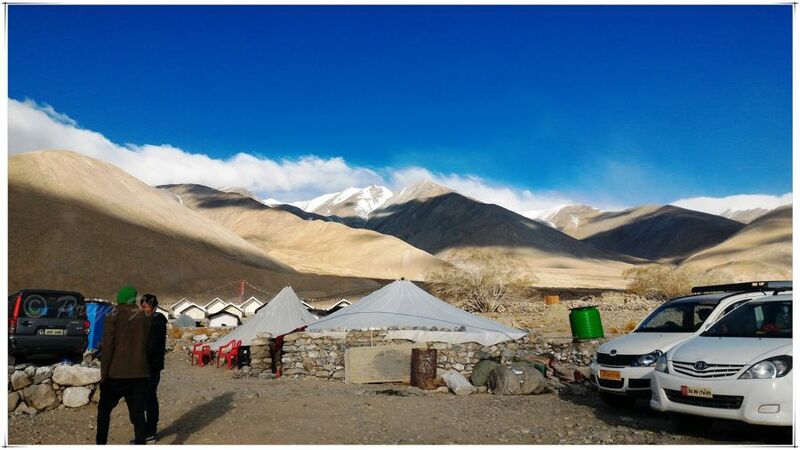 They were very flexible with our itinerary and arranged for our Pangong Lake stay in a tented camp overnight. It cost extra, of course, but it was well worth it. 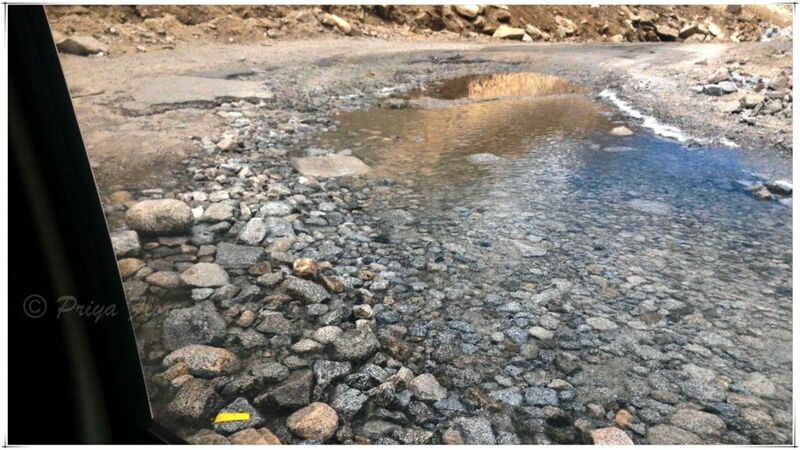 This brackish-water lake is situated at an elevation of 4,350 meters (14,270 feet). It is 134 kilometres (83 miles) long and extends from India to China. About 60% of the length of the lake lies in China. During winter the lake freezes completely, despite being saline water. The closer you get to Pangong Tso, the more likely you are to see marshes and wetlands formed by the streams that feed the lake from the Indian side. 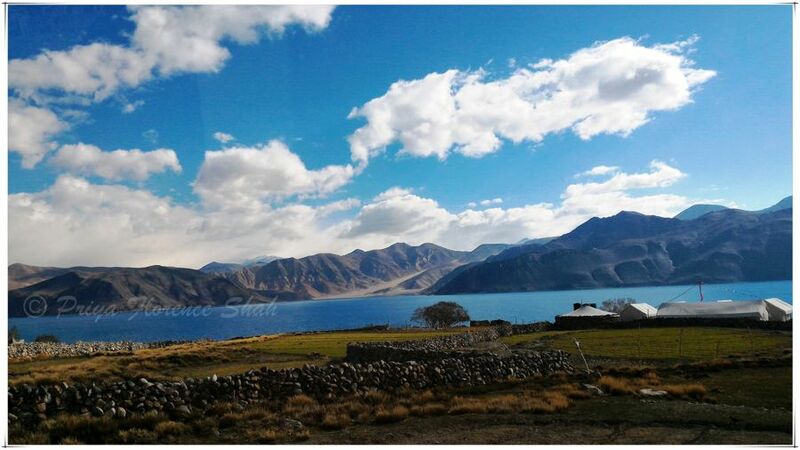 Pangong Tso is sacred to the locals, so swimming or water sports are not allowed here. For security reasons, India does not permit boating on the lake. As the lake lies on the Sino-Indian Line of Actual Control, an Inner Line Permit is required to visit the lake. 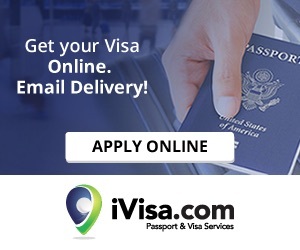 While Indian nationals can obtain individual permits, others must have group permits (with a minimum of 3 persons) accompanied by an accredited guide. The tourist office in Leh issues the permits for a small fee. 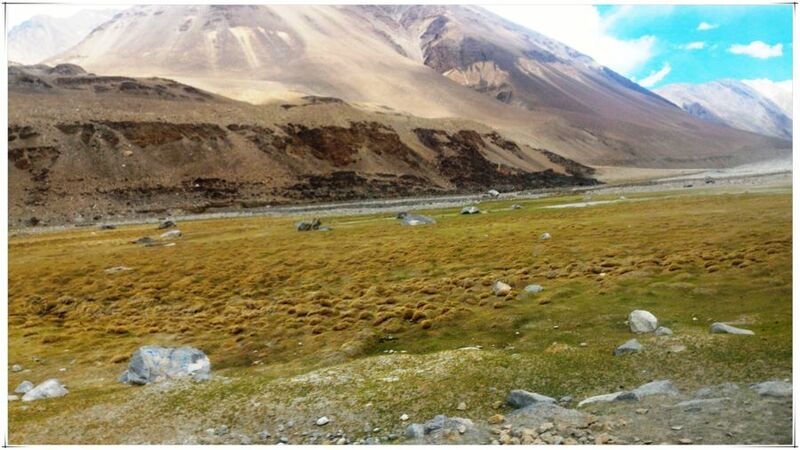 To get to Pangong Lake, you have to pass through the Chang-La Pass, claimed to be the second-highest motorable road in the world at an altitude of 5,360 meters (17,590 feet). Craggy rock formations dot the landscape on the way. 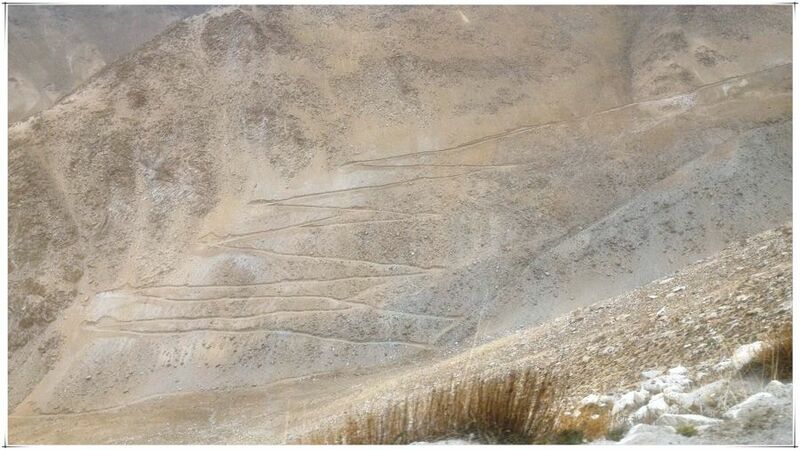 The climb is very steep and requires a careful drive. The stretch of 10 to 15 kilometres of road on either side from Chang-la is loose dirt and slush and dangerous for bikers, especially in the summer months. 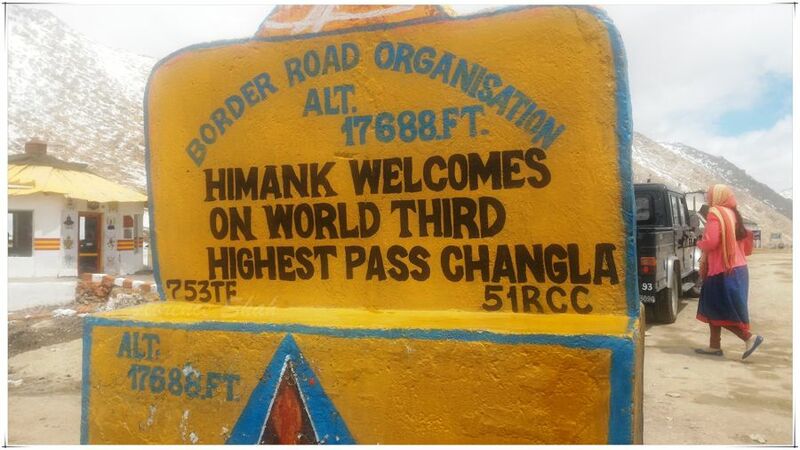 I have great respect for the Border Roads Organisation and Himank, who build and maintain these high-altitude roads. 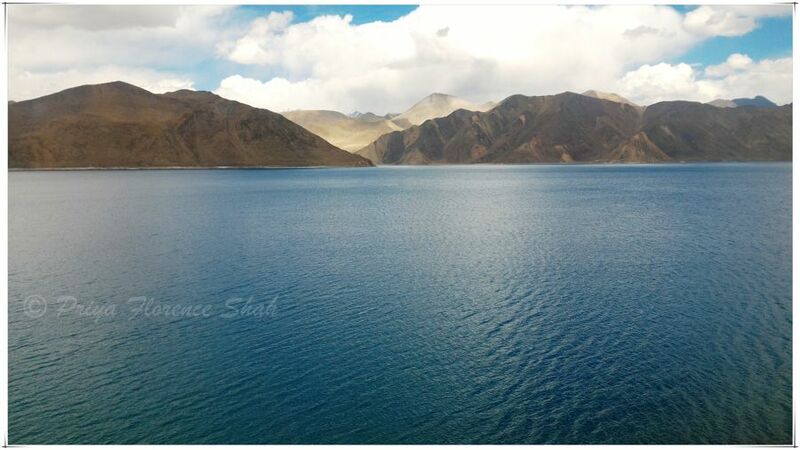 My first glimpse of the blue waters of Pangong Tso through the mountains was heavenly. It was every bit as mesmerizing as I’d imagined it to be. It was May, so it was still very cold, especially at night, when we had to leave the relative warmth of our tent to walk to the dining tent, a few feet away. We reached there just as dinner was getting over and only managed to grab a few handfuls of rice and dal and a papad or two. My kid was not happy about us spending the night because of the freezing cold. But I loved watching the sunrise, which was surreal. For some reason, being at that altitude made it seem all the more sacred and spiritual. It made me understand why rishis (seers) and holy men seem to prefer high-altitude living. It’s not just the isolation, it’s also the sense of grandeur that such a place inspires. 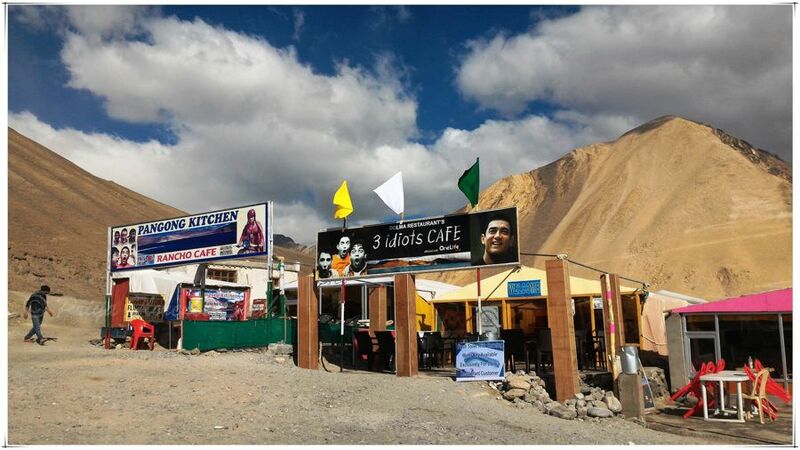 Because we were travelling back to Leh on our own, we were able to stop at a spot near the lake called 3 Idiots Point (made famous by the Aamir Khan movie, 3 Idiots, which was partly filmed at Pangong Tso). 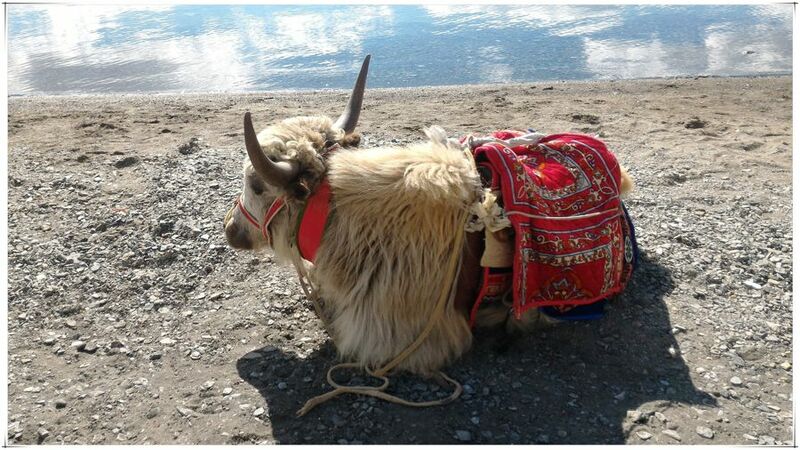 We met a local who owned a pair of yak. He consented to allow me to click his photos for INR 20. I paid him 100 rupees in a moment of generosity. I also got the chance to see the crystal-clear waters of the lake up close and spend some time at the lakeshore. Had we settled for the day excursion, we would have missed out on so much. Pangong Tso was the highlight of my visit to Ladakh. Given a chance, I would love to go back and see Tso Moriri, and a few more high-altitude lakes in Ladakh. Watch out for altitude sickness or acute mountain sickness caused by exposure to low oxygen levels at high elevations. Symptoms may include a headache, vomiting, feeling tired, trouble sleeping, and dizziness. If you experience any of these symptoms, move to a lower elevation. Don’t plan too many activities in a single day. Listen to your body and take rest when you need to rest, even if it’s the middle of the day. Travel with a tourist guide. Ladakh is a remote area near the Indian and Chinese borders. It’s not advisable to travel solo or without a guide who knows the area for fear of straying into disputed territories. Keep your passport on you at all times, even if you’re an Indian tourist. Permits are required to visit some areas. Your passport or ID will be required to issue these permits. Ladakh conjures up for me a land of stark mountain ranges, serene high-altitude lakes, and blue skies with cold desert landscapes. It’s a wonderful place, Patti. If you’re more adventurous, try staying in a homestay to experience the local culture. That’s one thing I missed out on with my package tour. Your post has inspired me to go to Leh Ladakh with my kid. She too has asthma problems, but otherwise sturdy. Maybe next summer. Thanks for the detailed post. I don’t think asthma has anything to do with altitude sickness, after seeing how well my kid managed in Ladakh. I was the one affected, so it probably has more to do with overall fitness levels. Believe me Priya, I have Ladakh on my radar for so long. I am currently testing familiar waters with my girl’s squad but would soon try to head out to the ever beautiful Leh – Ladak. Fingers crossed! Thanks for sharing this informative post with us thus inspiring us more! It’s really worth it, Anwesha. Try to spend as much time as you can and take in the local culture if you can. My trip was too short to do that. I love mountains and this region looks so appealing! India has been in my plans for a long time but I wouldn’t go for less than a month and that makes it tricky. Great work with the camera by the way. Thanks, Chris. These photos were taken with a simple point-and-shoot. My pre-Canon days. The landscape is so photogenic, you can’t help but get great photos. And yes, you should spend at least 2 months in India to do it justice. Oh I would love to take the mountain hike. Never tried to go to very high attitudes though. Have been mostly around Norway. This place looks tempting to try though.. Adventure tourism is big in Ladakh. 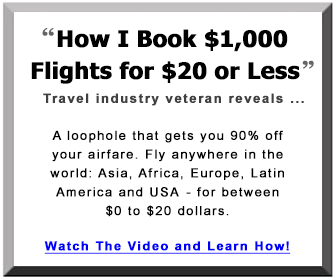 You just have to find a good travel agency to help you get around. Great photography and post. Looks so wonderful! Thanks. It’s a very photogenic place. Photographers would love it here. I am a total sucker for anywher ewhere there are plently of lakes, mountains and I would love to check out this hike. I love going as high as I can as I feel I can touch the sky. Hope to get to this area one day as I love hiking. Yes, I’m sure you can go hiking, but it’s better to travel with a good tour guide in these remote areas. I’m sure it’s wonderful for hiking, but do it with a guide, not alone. 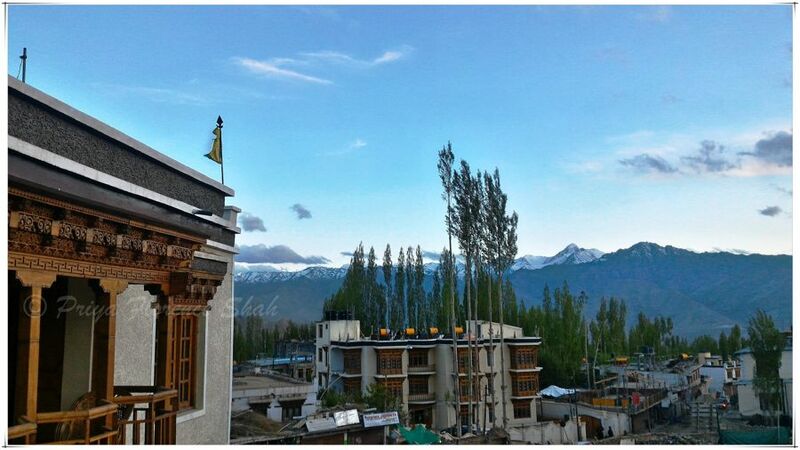 I have a fascination with mountain destinations and Ladakh looks like somewhere I need to visit. 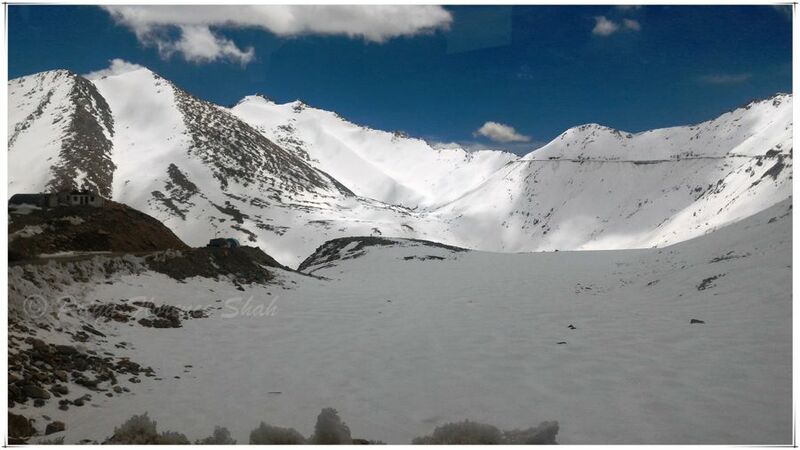 The power and natural beauty of the snowcapped mountain scenery is quite moving. I’ve always thought of Ladakh as a hiking destination so it’s good to know there are lots of other things to see there too. Ladakh is a haven for both adventure tourists and families. Since it’s a very remote area and close to the Indian border, I do not recommend going it alone. Always better to have a guide with you in such places. Wild and remote! What more can you ask for? I can understand why it would be best to go with a guide. I agree, Nancie. It’s also a place of strategic importance for the Indian military, so best not to get lost there. This is a very remote place but have a unique beauty. 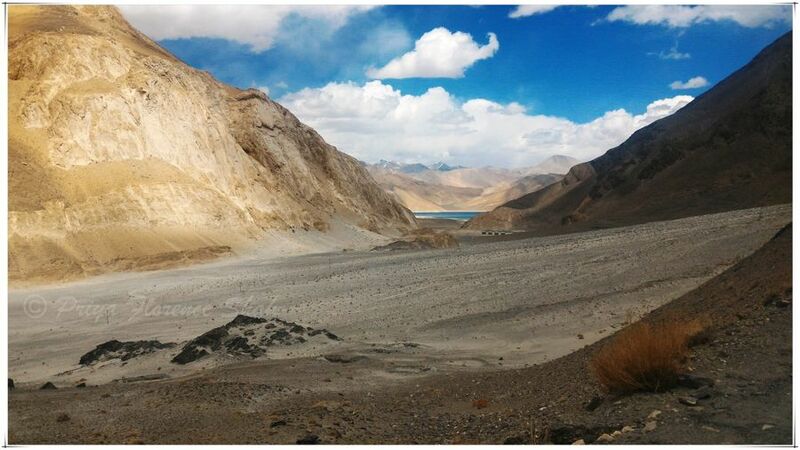 Thanks for sharing this wonder of Ladakh. It is amazing! Yes, it is very beautiful indeed. Definitely the perfect place for a romantic trip if you love adventure travel. Thanks, Anna. Glad you like the photos. How cute are those camels! It’s lovely that you got some free food at the Sikh temple on the way back too, the treck certainly gave you some good views! The free food (langar) is a tradition practised by the Sikh community. I loved the camels, but don’t like to see animals being exploited. What wonderful photos of a magical landscape! 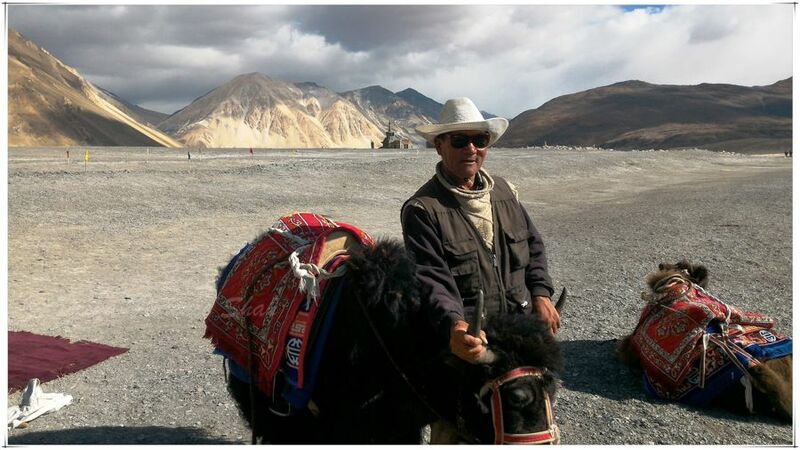 I know nothing about Ladakh, or the Nubra Valley, so I enjoyed this post a lot. The Tibetan noodle soup sounds interesting and I’d like to see the old Tibetan monastery too. 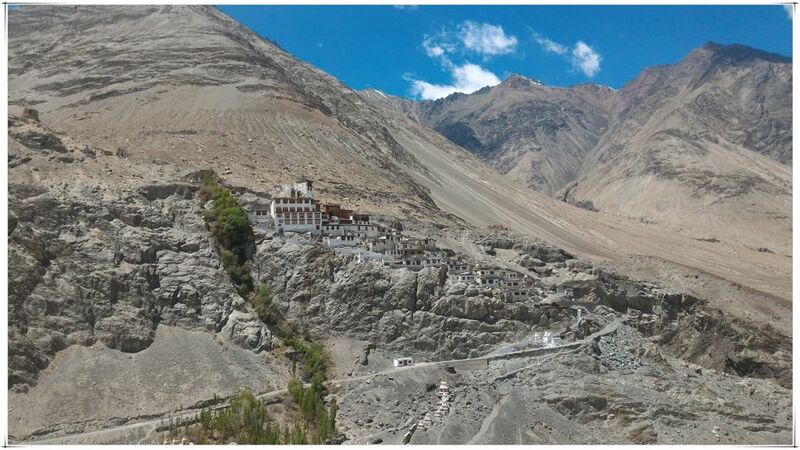 If you love monasteries, Ladakh is the place for you. There are so many to see, it’s hard to cover all in a short trip. …and this is right up my alleyway. Also, good on you for boycotting the camel rides, the animal exploitation needs to stop. Thanks, Kristen. I really hope you can make it to Ladakh soon. It’s actually very easy if you’re travelling with a good agency. Hope you can visit Ladakh sometime. Ladakh is heaven and it is one of the prettiest places I’ve ever been to in India. It’s good advice from Makemytrip to give yourself a day to get acclimatized before venturing out. Good that your kid didn’t have any issues despite the history with asthma, several people tend to take some time getting used to the lower oxygen levels. Such dramatic landscapes, I love your pictures! Yes, it really is spectacular, Medha. I think getting acclimatized has more to do with overall fitness levels. Then again mountaineers who are very fit also get altitude sickness. Glad you liked the pictures. Ladakh is a beautiful tourist destination in India. 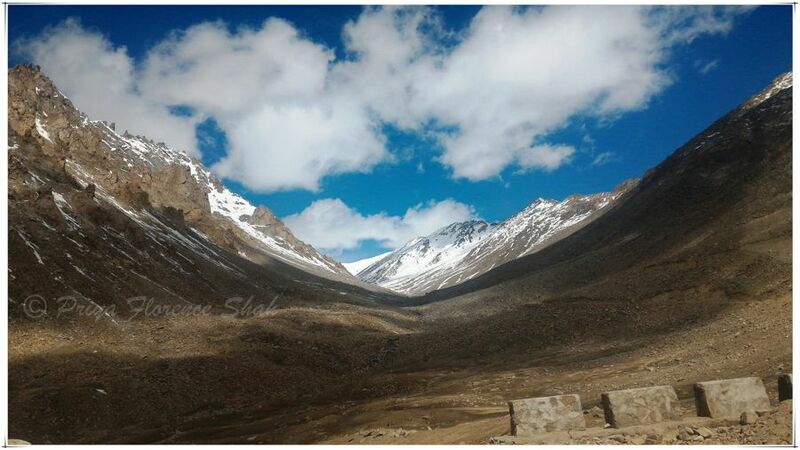 I never Visit Ladakh, and your pictures make me crazy and Now m planning to go to Ladakh. Thanks for sharing with us this post. 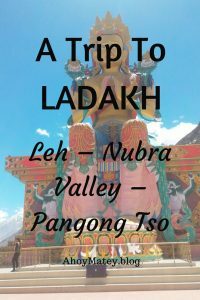 Awesome guide,I loved the information,I love Ladakh so much . Ladakh pictures are very nice.Your blog information help me a lot,it’s give such a great information which is very helpful.thanks for sharing such a grate ideas. I hope you do, Remo. You won’t be disappointed. 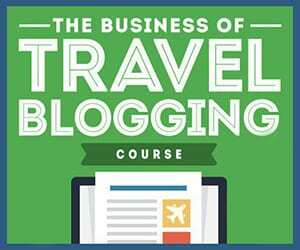 What a great guide and how to get there. I like how you also made us aware of all the sightseeing spots. I have never been but i am certainly inspired to go just for the amazing scenery. Thanks for sharing! I loved the pics…I haven’t explored so much in India, wish to do it soon. I also agree with the acclimitizing. I got sick at an altitude of 8000ft. 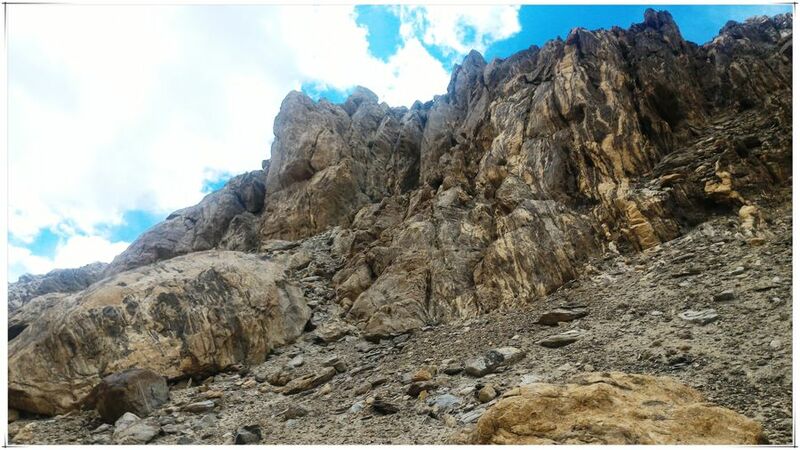 Altitude sickness is a real danger in Ladakh. You can take some medication prescribed by a doctor or go to a lower altitude if you experience symptoms.